EXCITING NEWS EVERYONE! 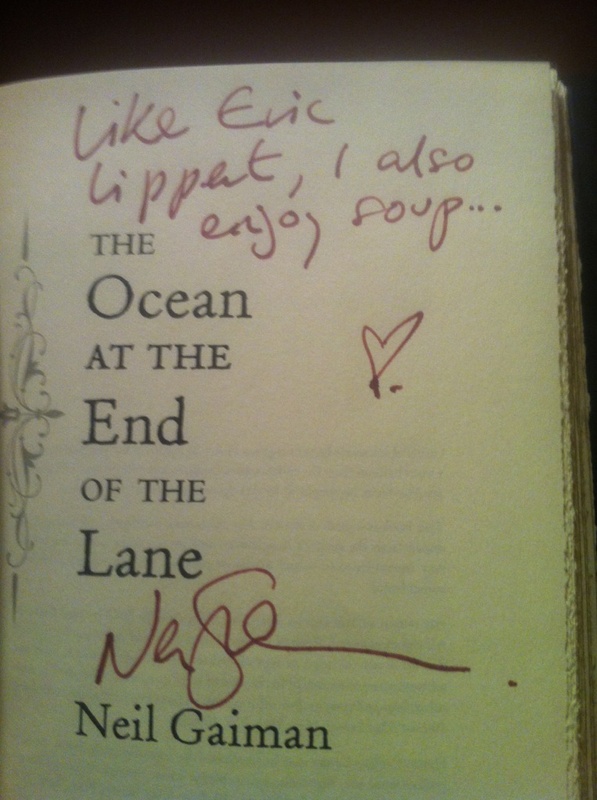 Like Eric Lippert, Neil Gaiman enjoys soup! British fantasy author Neil Gaiman was in Seattle recently. I was so disappointed that I did not find out about it until it was too late to attend his event. It’s a pity I missed it because I’ve been wanting for years to ask Neil Gaiman if he likes soup. To explain why, we’ll have to go back to 1993. Remember 1993? The first wave of HTTP-based document servers were going up on the internet; it was the beginning of the internet as we know it today. I was studying mathematics at Waterloo at the time. I fondly remember when we first got the Mosaic browser up and running on the colour x-terminals; it was so much more convenient than using a combination of FTP, TELNET and GOPHER clients. While browsing around I found a “Star Trek” fan web page; in fact, I suspect that I found the only “Star Trek” fan page, and I thought, hey, that’s a fun idea. I could do that! I looked around the internet – which did not take long in 1993 – and could not find a similar “Lord of the Rings” fan page. I found a fair amount of material on Tolkien: articles, and scanned-in artwork, and elvish fonts and so on, but no central “one stop shopping” location to categorize them. So I built one out of rudimentary HTML and stuck it up on the math computing department’s student GOPHER server. A few months later the UW Computer Science Club put up a real HTTP web server so I rented some space from them for a couple of bucks a term and put the page “on the web”. The “first mover advantage” of being the first person to put a Tolkien fan page up on the internet was considerable. Search engines use factors like the number of inbound links and the amount of time the page has been linked to as metrics for its relevance. Thus for many years my page was the first hit in every major search engine when you looked for “Tolkien”. Which a lot of people did. That led to much interesting correspondence from writers, students, teachers, trivia game show fact-checkers and even some of Tolkien’s relatives, which I enjoyed immensely. Of course, journalists were using search engines by the time word of the movie trilogy broke, and therefore a number of them found me. Figuring I must be an expert, some of them then interviewed me about my opinions on the books and upcoming movies. I hasten to note that this is already slightly ludicrous. I mean, sure, I collect books about Tolkien’s work and life, so I am in some sense an expert, but I am certainly no scholar. I’m an informed and opinionated amateur at best. Eric Lippert, who created one of the first Tolkien Web sites in 1993, sees the anti-Tolkien contingent as little more than literary snobs. […blah blah blah…] Neil Gaiman, author of the fantasy series “The Sandman,” said Tolkien “exists outside the orthodox canon of literature. You can’t put him in a box.” Like Lippert, Gaiman believes that Tolkien’s commercial success is what drove his critics to jealous fury. Ever since then I have pondered this question: what other beliefs does Neil Gaiman share with me? Neil Gaiman, if somehow you are reading this: I like soup. Do you like soup too? If you also like soup then like Eric Lippert, Neil Gaiman enjoys soup. And while we’re at it, what about snow peas? The outdoors? Talking? Not talking? You certainly agree with me about a lot of things, Neil Gaiman! Many thanks to Amber, who waited over three hours to spend her allotted few seconds with Neil talking about soup, and of course thanks to my good buddy Neil Gaiman, who we now know for certain agrees with me on two important subjects. UPDATE: Neil Gaiman has “tweeted” a link to this blog post, and so we know that Neil Gaiman knows why Amber was asking him about soup. I am sure “Neil Gaiman, do you like soup?” is not the strangest question he gets asked at book signings. “I love soup!” was his immediate answer according to Amber. This entry was posted in Non-computer and tagged neil gaiman, soup, Tolkien by ericlippert. Bookmark the permalink. It’s an amazing feeling when you can somehow relate to someone that you look up to, or admire. So, Filip, do you like soup? If so, then Filip Ekberg, like Eric Lippert, enjoys soup. I don’t enjoy soup all that much. The fact that I now disagree with both Eric Lippert and Neil Gaiman marks me as an iconoclast worth watching out for. When my views take the world by storm (as they inevitably will), historians should take note that this was the birthplace of the dangerous controversy. I don’t particularly like soup. I do think C# is a pretty decent language. I think one can safely say “Like Martijn Hoekstra, Eric Lippert thinks C# is a pretty decent language”. I do enjoy soup. So much so that I make several types from scratch every new years day. I know! I am sorry I have never made it to your soup party because you know, I like soup. You should set up a Tumblr blog for soup. I would certainly contribute with my soup-based experiences (my wife and I making borscht, gazpacho, and perhaps a third soup this week). Look, seriously, it depends on the soup. Craig Kaplan, like Eric Lippert, likes soup. Nathalie Nasr likes soup too, but not as much as Craig Kaplan does. Excellent! When you get back from your trip we should all get together for soup! We will miss you this year! All this soup sounds a little fishy. It’s not code smell because there is no code. That’s the perfect program right there. I like sushi. Eric do you like sushi? Like Duncan, Eric Lippert enjoys sushi. I just like the very helpful details anyone supply in your articles. Let me take note of the site and also check again right here usually. My business is considerably guaranteed I will be informed quite a few brand-new things here! All the best for one more!